‎The group Organizing for Occupation will bring Occupy Wall Street to Downtown Brooklyn on Thursday, in a joint action from the two groups at Brooklyn Supreme Cout that will call for an end to foreclosure auctions. You can come right to Times Square at 5pm or take part in one of many other earlier actions. Student meet up at 12pm, Washington Square Park, Labor March on the Banks 11am from Liberty Square. Occupy Wall Street, the movement whose organizational forms and demands are evolving continues to pick up support including organized labor. Transport Union Local 100, hospitals Local 1199, city workers’ DC 37 AFSCME, UAW Local 2110, Teamster Local 814 and building service workers Local 32-BJ and the United Federation of Teachers were just some of the unions which pledged solidarity at a massive support rally in NYC which drew tens of thousands. With each passing day, as the violence of the state continues to escalate, the myth of American “democracy” becomes further shattered. The posters provided on this page are free for you to download, print, and hang up within your community, not only to promote local efforts, but the solidarity of all occupiers around the country. In fact, we highly encourage it as this will be a great means of spreading the word and getting others involved. Lost in the ruckus of yesterday’s police riot on Occupy Boston was the fact that earlier in the day, approximately 10,000 students marched through the streets of Boston in support of the “Occupy” movement. Chants like, “Not another nickel, not another dime, no more money for Obama’s crimes,” and “They got bailed out, we got sold out,” reflected the diversity of demands among the crowd. Many carried signs opposing Obama’s increased use of unmanned aerial drones to carry out extra-judicial assassinations in places like Pakistan, Yemen and Somalia as part of a campaign across upstate New York called, “Ground the Drones.” Others brought attention to the $3 billion in direct aid that the U.S. gives Israel each year to enable to continued oppression of Palestinians in the West Bank and Gaza. Of course they should stand with the workers, an exasperated young woman responded. The workers are the 99% who are ruled and oppressed by the 1% in American society, and that’s exactly with whom Occupy L.A. must stand. Occupy The Hood stands in Solidarity with the Occupy Wall Street movement… It is imperative that the voice of POC is heard at this moment! We must not be forgotten as the world progresses to the next economical stage. We can all agree that the voices in our communities are especially needed in this humanitarian struggle. 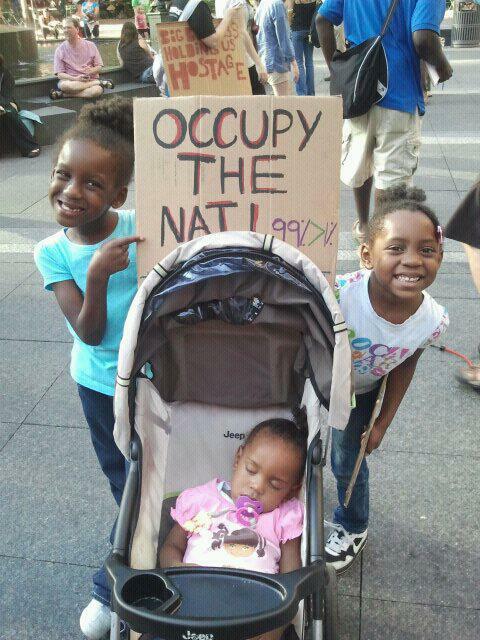 We are our future and we posses the energy needed to push the occupy movement to the next phase. “Awareness is the beginning of the process of getting people involved to express their concerns of the silencing of dissent and student protest,” said Hatem Bazian, a lecturer in the campus Department of Near Eastern Studies, who was present at the demonstration. The hunger strikers at California’s Pelican Bay prison and tens of thousands like them throughout the U.S. Prison Gulag have been marked for annihilation, in all the ways that matter for human beings. This is not an issue for reformist tinkering, but a fundamental question of human rights. Human rights goals cannot be effectively pursued within the context of institutions that are designed to destroy humanity. Any collaboration with Obama and his corporate Democrats means the instantaneous death of the movement – and rightly so. Ultimately, finance capital must be utterly destroyed, or it will kill us all. But that’s a truth that will be learned in struggle, once joined. Mass action is the only way to prevent further inequality, and further American aggression around the world. Occupy Wall Street can be the beginning of a great movement, or a lost opportunity. The experiment may be in its beginning stages, but the learning curve has to be brief if OWS is to not only remain free from political interference, but make good on its claims of fighting for the interests of working people. In every city and town, there are teachers who are under attack, foreclosures mounting, instances of police violence. The Occupy movement can be a part of responding. We want to build the occupations and defend them against police attack. And we also want to build a political space that goes beyond the occupations–a new resistance that brings the spirit of the Occupy movement to workplaces, campuses and communities throughout society. The lineup couldn’t be clearer. The Democrats are seeking to co-opt the anti-Wall Street movement, lining it up behind a president who was elected with the largest campaign war chest ever funded by Wall Street and who has spent his first term in office defending the interests of the banks, finance houses and the top 1 percent. Ex-lefts like Gitlin are enlisted in this sordid operation to provide a “progressive” gloss to what amounts to a cynical attempt to hijack the protests. TRNN Report: Angry protestors call for overthrow of the Egyptian military regime as many are killed by Army. The South Korean protest echoes the message of the hundreds camped out in Zuccotti Park for more than three weeks by inspiring the “99%” to stand up against the mega wealthy “1%” who benefit from an unjust, toxic financial system, they say. “We will join the global movement and gather the voices of desperate Koreans,” the group said in a release. The General Labour Confederation, Lebanon’s largest worker coalition, has spearheaded plans for the 12 October strike demanding a more than doubling of minimum wages in the public and private sectors. Employee unions across the board are vowing to participate in the strike. If the swap deal materializes, about five-thousand Palestinian political prisoners still remain in Israeli jails. Every reason for the Hunger Strike for Palestine movement to continue its actions. A Facebook page titled ‘Occupy London’s Stock Exchange’ has already amassed over 3,000 people who have agreed to attend the event on October 15 while ‘Occupy London’ on Twitter has over 1,000 followers.